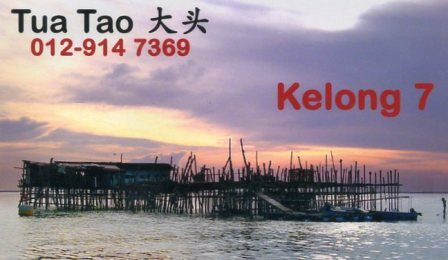 This Kelong is listed as Kelong 7 and it's the smallest and I believe currently the one furthermost west from the second link in the Johore Straits. 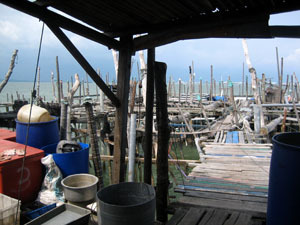 This Kelong is in Malaysia territory even though it is physically nearer to Singapore mainland then the Malaysia mainland. 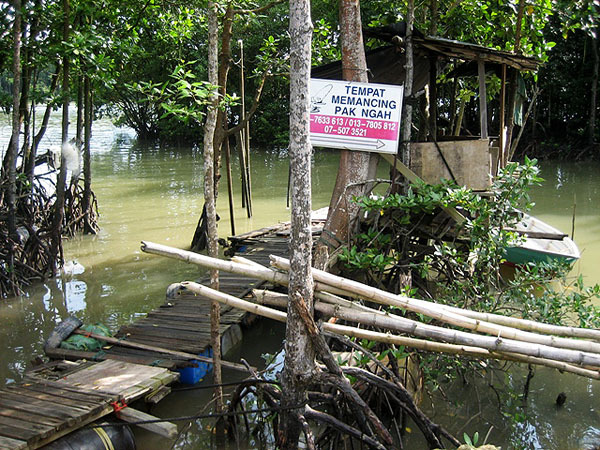 The reason the image is stamped with the "Decommissioned" text is because I was told this kelong is currently not in operation after a tug boat or a barge has hit part of the structure, I am not sure if the current owner or future owners might decided to rebuild whatever that was destroyed. 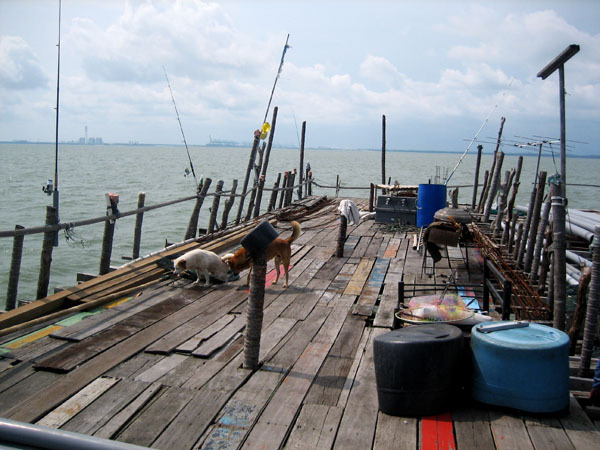 Above are images of the Pendas jetty that we board the boat to the kelong from. 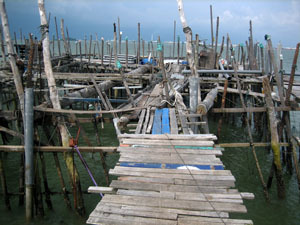 This pier is just near the mouth of Sungai Pendas. 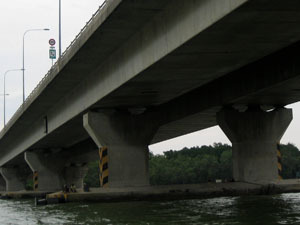 To reach this place you have to cross the Second Link, turn left into the Tanjong Pelepas Highway, then turn into the J4 highway (Jalan Tanjong Kupang) which loops under the second link towards the Pendas Jetty. It's rather easy to find, just look at google map and look for J4 highway that loop under the second link, toward the left of the second link is the pier. 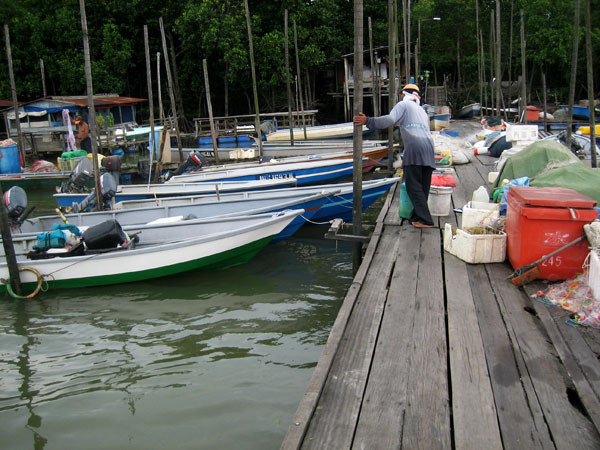 There are two main jetty that you can board the boat to the kelong. The first and the main jetty that you will probably use will be the jetty shown (2nd in the series of pictures above), and the other jetty will be the one that are shown in the pictures below. 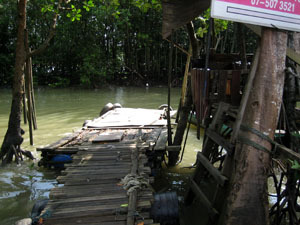 But between the two jetties, there are also some make shift jetties which if you're unfortunate, you might need to use. 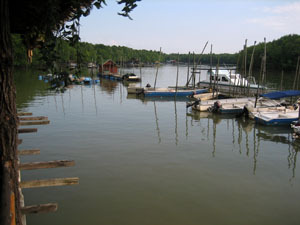 This is the second jetty that you might be ask to board the boat from. If you look the the picture immediately above you can see the main jetty structure, the yellowish building about 300 to 400 meters to the front. So the distant between both jetty is not far. This is the place where we park our vehicle. 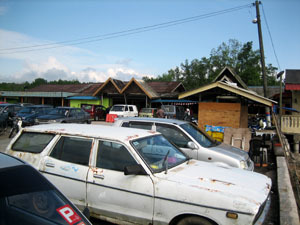 There is a free public carpark where the main jetty is. There is no security to look after the vehicles, but so far I did not have any problem parking here. 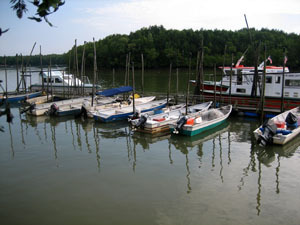 Above are some shots from the mouth of Sungai Pendas. 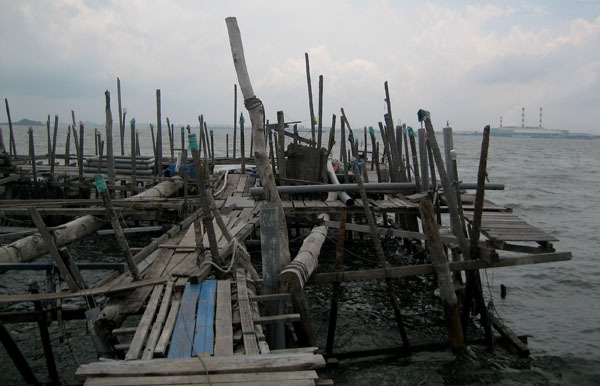 Once you exit from the river into the Johore Straits, you will see some floating fish farms. 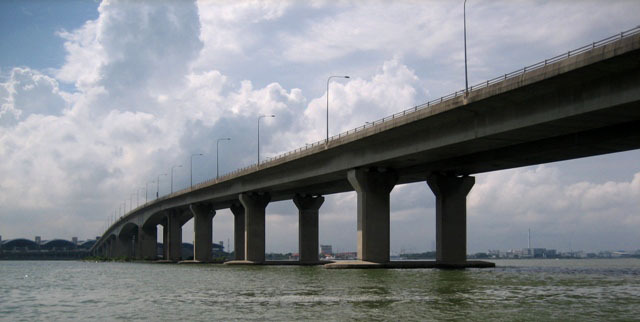 To get to the kelong, you'll need to pass under the second link to get to the west side of the bridge. 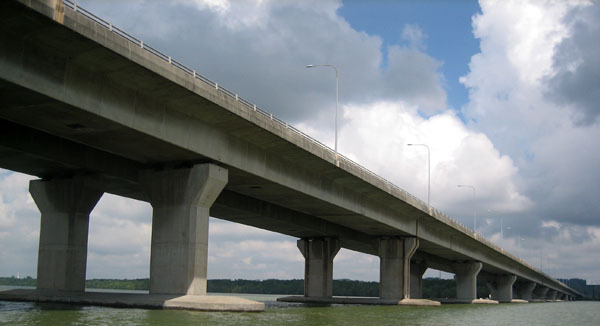 If you notice, you also see people fishing on the base of the bridge. These people I see fishing, are on the Malaysia side of the straits, so I am not sure if you're allow to fish this way over at Singapore side. I assume these people caught a boat from the same jetty we came from and arrange for the boat to pick them up when they want to return. Much like in those days when we could fish under the base of the Shears Bridge by catching a bum boat from Clifford Pier. The 2 images above shows the net hoisting structure and it's obvious it is in a pretty run down condition and the stilts needs some serious repair work to be done. 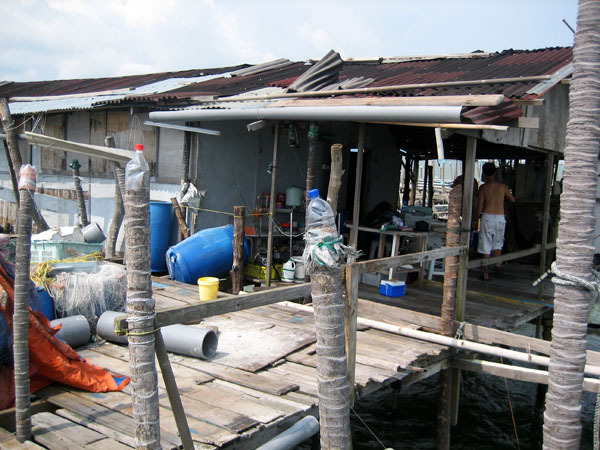 The owner who has just taken over at the time when I visited and has intention of doing up this kelong, he has plan to re-stilt some part of the structure soon with concrete pillar instead of wooden poles. I did see some work in progress but I am not sure how fast is the renovation being done. 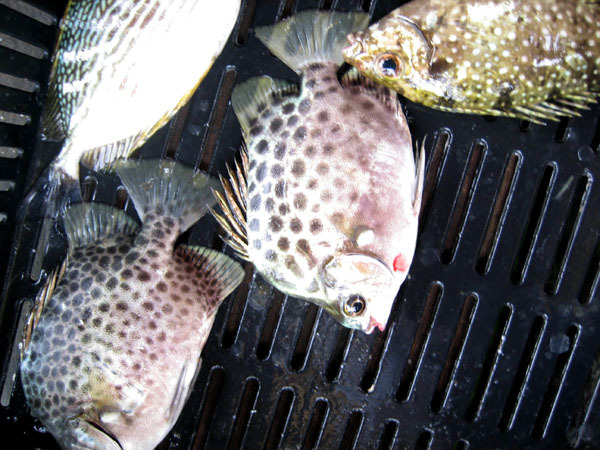 Incidentally at the spot where the the entrance of this corral, where the fishes are funnel into this trap, the bottom is sand based and the whitings or pasir pasir you can land on that spot is huge about 10" and puts up a real good fight too. 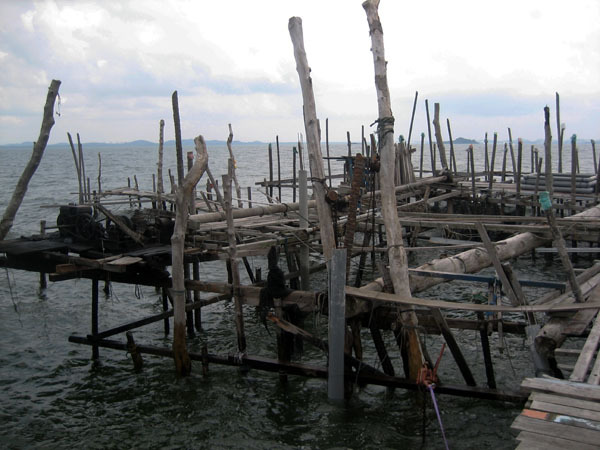 There are some platform all around this structure that you can fish from. 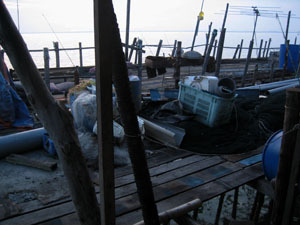 Above are shots of the main fishing platform on this kelong. It's not very big and a bit cluttered. 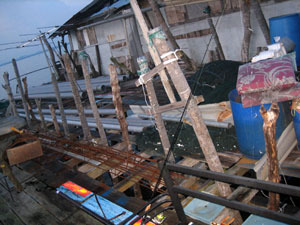 A lot of planks and re-bar every where. 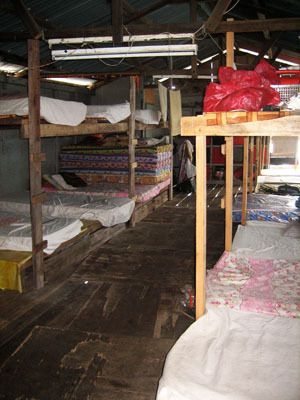 This is not a place for children or ladies, they have simple "drop-in" toilets and rain water to flush, bath and brush. Do limit your expectation regarding facilities if you do come, people who have higher standards will be disappointed. 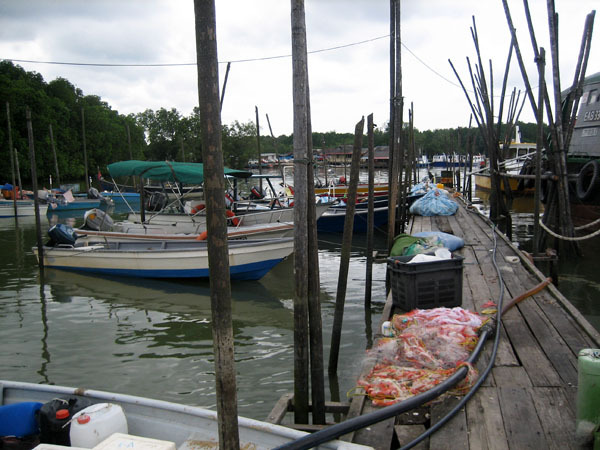 This is a working kelong and we're here to utilize the place to fish, eat and sleep. If you've this mentality you'll be fine here. We bring our own water but they can provide a stove and some simple utensils for boiling water and cooking instant noodle. 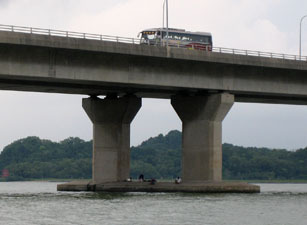 Make shift bridge that connect the main structure to the net hoisting structure. 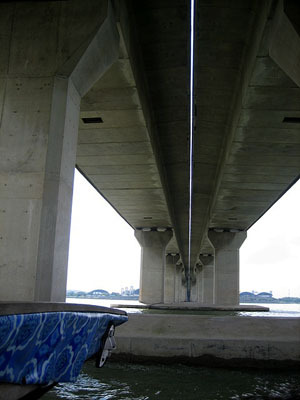 Takes a bit of guts to walk across especially at night, where the only light is from the spotlight that is used to lure the bait fishes into the structure. 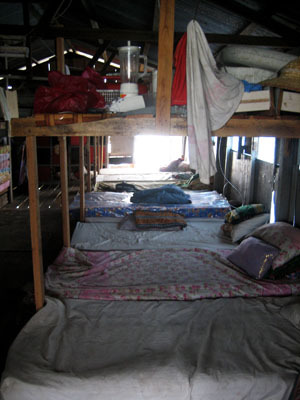 The sleeping quarters is the standard kelong fare, I did spend a night on one of this beds, not sure when were the last time the sheets were laundered but like I said, keep your expectation low and you'll be fine. Or bring a ground sheet or sleeping bag. 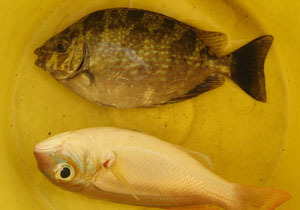 Fishes that's supposed to be present in the area are Mackerel, Grunter, Snapper (Finger Mark, Ang Kuay, etc), Catfish, Sting Ray, Trgger(Ayam Fish), Groupers, Gelama, Threadfin Salmon, Scats(Kim Khor), Spotted Rabbit fish(Pei Tor), Streaked Rabbit(Lai Mang), Bream (Ang KoLi), Tamban, Selar and other baitfish, big Whiting (Pasir Pasir)and pest like Kelong Chi, small eels, etc. Anyway, a good thing about this place is that it's so near Singapore you can get SingTel signal at almost full strength. 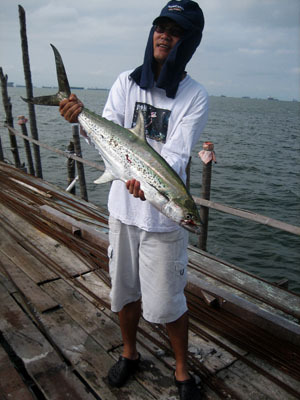 The contact I had for this kelong is below.